September is Ovarian Cancer Awareness Month and State health officials encourage women to talk to their doctor about their risks. While there is no available screening for early detection of ovarian cancer, there are tests available for high risk women and those who display symptoms. Ovarian cancer occurs when malignant cells are found in the tissue of a female's ovary. Ovarian cancer is the fifth leading cause of cancer death in Hoosier women. In 2010, the most recent year for which data are available, 395 cases were diagnosed and 330 deaths occurred. It is responsible for more deaths than any other cancer of the female reproductive system. Nationally, the American Cancer Society estimates that approximately 22,000 American women will be diagnosed this year and 13,850 will die of the disease. "Family history plays a large role is determining who is at risk for ovarian cancer," said Indiana State Department of Health Chief Medical Officer Joan Duwve, M.D. "Women with a family history of breast or ovarian cancer, or those who themselves have had breast cancer should talk to their doctors about whether genetic testing for inherited mutations in BRCA1 or BRCA2 genes is appropriate for them." * Age. Ovarian cancer is rare in women younger than 40. Most ovarian cancers develop after menopause, with half of all ovarian cancers found in women 63 years old or older. * History of Hormone Replacement Therapy (HRT). Studies show that the use of estrogen alone as menopausal hormone therapy in women with intact ovaries can increase risk for developing ovarian cancer. * Smoking. Tobacco smoking increases the risk of mucinous ovarian cancer. * Obesity. Women with a body mass index of at least 30 may have a higher risk of developing ovarian cancer. * Other medical conditions. Conditions such as pelvic inflammatory disease and a genetic condition called hereditary nonpolyposis colorectal cancer (also called Lynch syndrome) may indicate an increased risk for ovarian cancer. The symptoms of early ovarian cancer are not specific and may not be obvious. The most common symptom is swelling of the abdomen caused by an accumulation of fluid. Some women may experience persistent, nonspecific symptoms including bloating, pelvic or abdominal pain, difficulty eating or feeling full quickly or urinary urgency or frequency. The American Cancer Society recommends that women who experience these types of symptoms consistently for more than a few weeks contact a healthcare provider. It is important to note that pap tests, the screening test for cervical cancer, do not detect ovarian cancer. 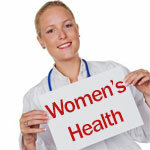 For women that are high risk and women with symptoms, a pelvic examination in combination with a transvaginal ultrasound and/or a blood test for the tumor marker CA125 may be used. Knowing your family history and seeing your doctor for persistent symptoms are important for early detection. For more information on ovarian cancer, including resources, visit www.IndianaCancer.org. To visit the Indiana State Department of Health's website, go to www.StateHealth.IN.gov. Follow us on Twitter at@StateHealthIN and on Facebook at www.facebook.com/isdh1.